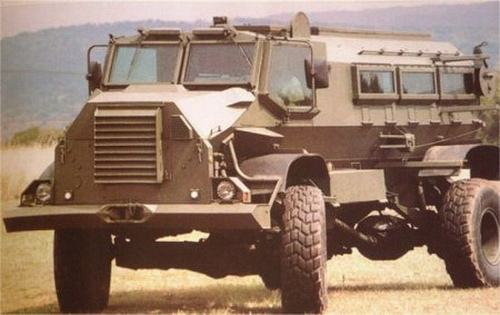 The South African Casspir Mk I – III Mine Resistant APC was the second of the Mine Resistant Vehicles to be developed and produced by South Africa. It was originally designed for the South African Police Force, however elements of the Police were part of the Special Forces and so the vehicle found its way in to the Army. The vehicle retained the V-Shaped hull bottom and most of the working parts being moved to the outside. It had a new hull mounted on a Bedford truck chassis. The driver and commander sat up front (with the hooded engine in front of them) with the embarked troops in the rear. They exited the vehicle from the rear It had ballistic proof windows fitted on all sides, which gave the crew and troops an all-round field of vision. The compartment was fully enclosed, unlike the Buffel, which gave better protection from artillery shell splinters and incoming fire. The commander was able to operate a ball mounted Machine Gun from within the vehicle and additional MG’s could be mounted on the roof and operated from a roof hatch. The Casspir was developed by CSIR (South Africa’s Council for Scientific and Industrial Research) who built about 200 (now referred to as the Mk1) during 1979/80. The production was taken over by TFM in 1981, which improved the design to the Mk II. Some 2500 Casspir series APC’s were built by TFM of South Africa, which was subsequently taken over by Reumech OMC. Casspir Mk III had a 170hp ADE-352T 6-cylinder turbo-diesel. Reumech in turn was taken over by Vickers Defence Systems of the UK and renamed Vickers OMC. When Alvis purchased Vickers Defence Systems to become Alvis Vickers, Vickers OMC became Alvis OMC. In 2004 BAE Systems acquired Alvis Vickers and Alvis OMC was renamed Land Systems OMC. MECHEM had its origins as the Applied Chemistry Unit (ACU) of the CSIR (Counsel for Scientific and Industrial Research of South Africa) tasked with research and development of mechanical and chemical solutions to defence related problems giving way to the name MECHEM. MECHEM is a subsidiary of Denel (Pty) Ltd and wholly owned by South African government. MECHEM coincided the re-launch with its 50th anniversary celebrations on 28 May 2010. Blesbok Freighter – with drop side cargo area for up to 5 tons (160 built). Can be used as a weapon platform. Angola, Djibouti, India, Indonesia, Mozambique, Namibia, Nepal, Peru, South Africa and Uganda.